Stair Parts, Moldings, and Dimensional Wood - Aged Woods, Inc.
Also, in conjunction with a flooring order, we offer our Aged Woods® in most common MOULDING profiles and in DIMENSIONAL form for millwork and cabinetry. Please call for quotes and availability. Click here to see custom-made air vents to match your Aged Woods® floor. If you have a staircase on your project, consider building/re-building it with authentic reclaimed antique wood treads, risers, nosings and other details. As with our Aged Woods® flooring, our stair parts are FSC-certified 100% recycled and bring the unique character and patina of reclaimed antiqe wood to what is usualy an important architectural detail. Stair parts to match our Antique or Antique Distressed® flooring are available and are sold only in conjunction with a flooring order. Antique Distressed® stair parts are graded for stability while matching as close as possible the corresponding flooring. All wood is kiln-dried to 8%, +/-2% before being glued up and/or milled. 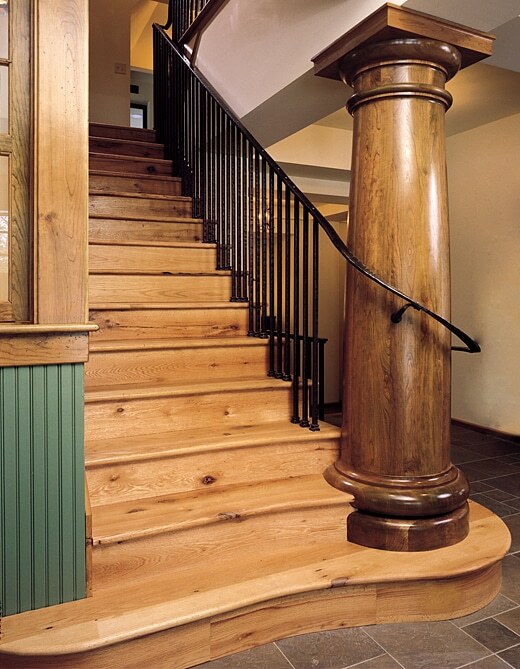 Only the soundest material is used for Aged Woods® stair parts. Standard treads are 5/4 glued-up 11-1/4˝ deep, planed to 1-1/16˝ and nosed. Length as ordered. Standard risers are 3/4˝ x 8˝. Length as ordered. Standard nosing is 5/4 x 3-1/2˝ solid stock, planed to 1-1/16˝ rabetted to 3/4˝ with a 1˝ deep nosed overhang. Length as ordered. Returns are referred to as being “LEFT” and “RIGHT” when standing at the bottom facing the staircase. U.S. Dollars Per LINEAL foot: TREADS range from about $30 to about $40, and risers and nosings range from about $15 to about $20, not including shipping. Lengths over 6′ and 10′ are 10% and 20% additional respectively. Returns are about $27 for ONE end and about $38 for BOTH ends. Stair parts are sold only in conjunction with flooring.